Like many soya foods, tofu originated in China. Legend has it that it was discovered about 2000 years ago by a Chinese cook who accidentally curdled soy milk when he added nigari seaweed. Introduced into Japan in the eighth century, tofu was originally called okabe. Its modern name did not come into use until 1400. By the 1960s, interest in healthy eating brought tofu to Western nations. Since that time, countless research has demonstrated the many benefits that soya and tofu can provide. Soya protein (from which tofu is derived) is believed to help lower levels of bad cholesterol (LDL). Tofu contains phytoestrogens called isoflavones – a group of chemicals found in plant foods. They have a similar structure to the female hormone oestrogen and therefore mimic the action of oestrogen produced by the body. They naturally bind to oestrogen receptor sites in human cells including breast cells – potentially reducing the risk of breast cancer. 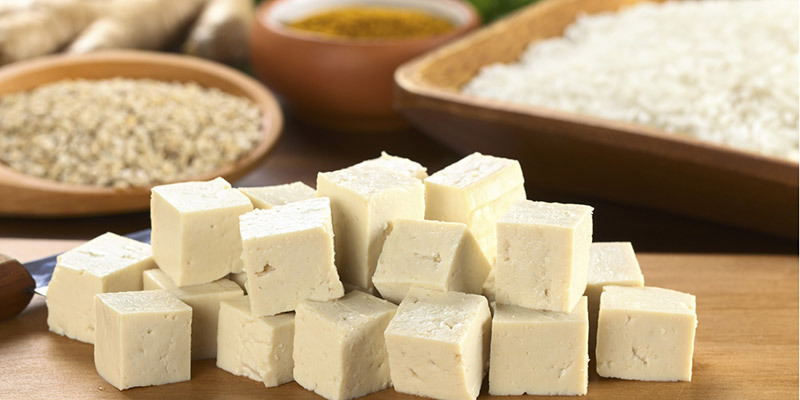 Due to the phytoestrogen content of soya, many women decide to include soya rich foods like tofu in their diet as they enter the menopause. During the menopause, the body’s natural production of oestrogen stops and symptoms may arise. As phytoestrogens act as a weak oestrogen, they may help relieve symptoms by boosting levels slightly, reducing hot flushes in some women. Genetics and environmental factors play a huge part in how our bodies react to certain foods, so as yet we can’t say whether a diet rich in phytoestrogenic foods is beneficial or not. If you are a vegetarian or vegan, soya based foods like tofu can be an invaluable part of your diet. Tofu and all soya products contain large amounts of oxalate. Individuals with a history of oxalate containing kidney stones should avoid over consuming soya products.